After much research about where to go for lunch, Steven, Gillian, Gavin and I decided to try a place called nOmPANG! We showed Sony, our tuk tuk driver, where to go on a map and we were on our way. We had chosen this place because it had some good reviews online and had been written up by a few other travelers. 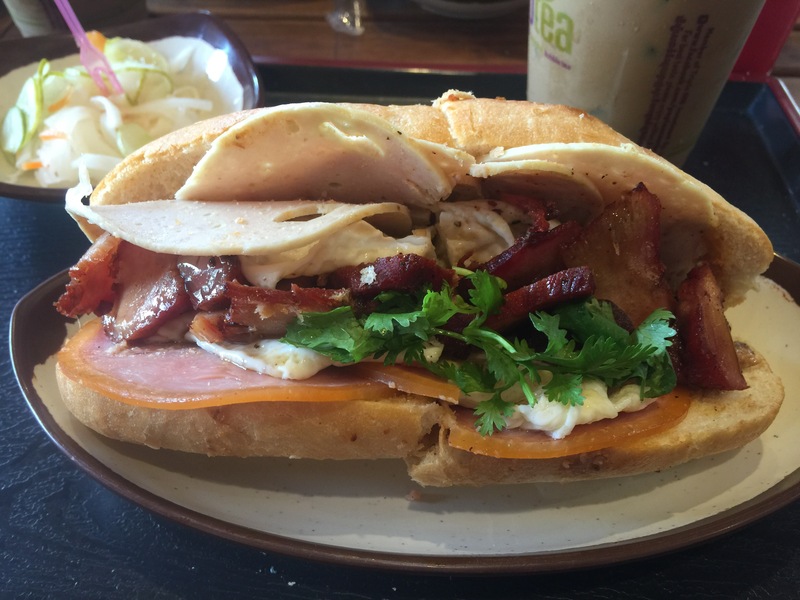 We just knew that they made great sandwiches and you could chose from a bunch of options inside. When we arrived we were pleasantly surprised by the decor and cleanliness of the restaurant. You can chose to take out or stay to eat at the small tables in the front. The place seats about 18 people. We went up to the counter to order and we chose the special with deli meats, pate, pork, and fried egg. The sandwich is also stuffed with fresh herbs and veggies and seasoned with some house sauces. We also ordered the sandwich with beef, which did not have a fried egg, but it did have the fresh herbs and sauce. Gillian and Gavin went for the plack pepper chicken ones. 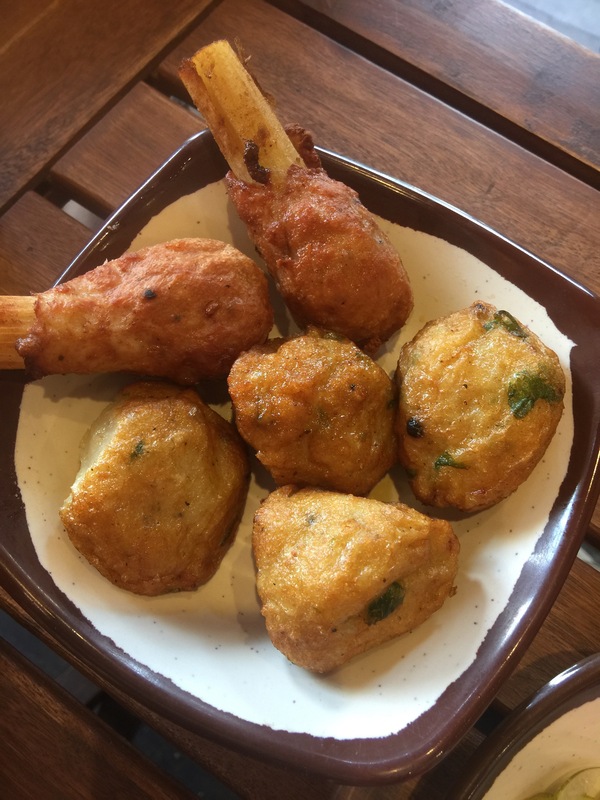 Finally, we ordered the sugar cane pork as a little side dish for everyone to share. We sat down at one of the four person tables and waited for our food to arrive. We think they usually have bubble tea, as it is on the menu and they have the machine, but it seemed as though they were sold out the day that we went. Our food arrive and each sandwich came with a side of pickled veggies. All of the sandwiches were great. They had great flavor and were the perfect size for one person for lunch. The best thing we ate were the sugar cane pork that were served with pork dumplings with egg inside as well. They were so flavorful, sweet and savory at the same time. 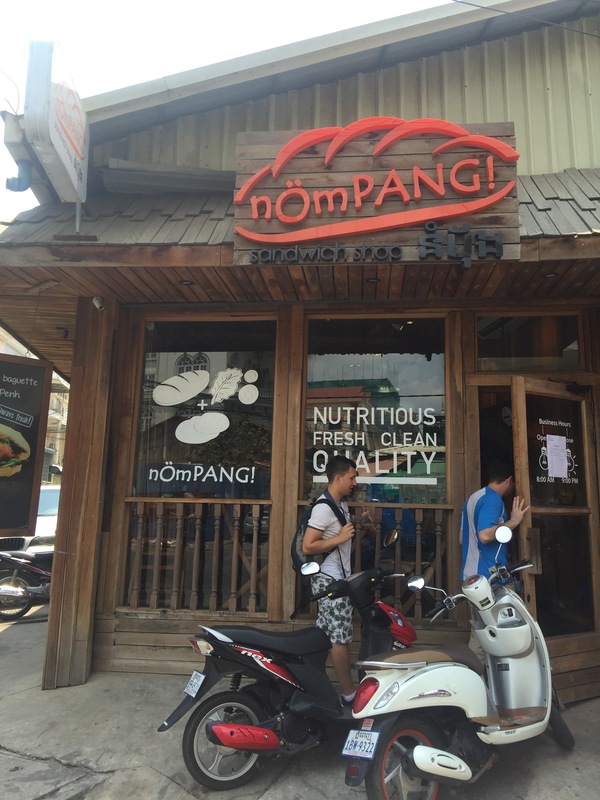 We definitely recommend stopping here for a good and inexpensive bite to eat while visiting Phnom Penh!! wish i had of known about this place when i was in Phnom Penh looks delish! Yes! So good…next time you visit you should check it out.